Oh dear. Normally this is where we would give a brief plot outline, but, like trying to describe the plot of Samurai Cop (1989), it’s truly a fruitless effort. 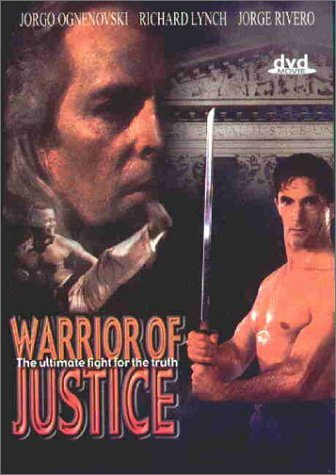 Warrior Of Justice is one of THOSE movies. A movie that, by any standard at all, is “bad”. But what is “Bad”? Sure, the movie has a horrendous shot-on-video look, atrocious sound, hacksaw editing, embarrassing lighting, Casio-keyboard music, actors that should be banned from attempting their craft, the supposed fight scenes have blows that don’t come close to connecting, and the movie as a whole is amateurish, childish, inept and mind-bogglingly stupid on every conceivable level...but this movie is hilarious! It’s truly a case of “so bad it’s good”. Well, maybe not GOOD, but certainly entertaining. Apparently, George (Ognenovski) is a martial arts instructor (dubbed “the Lone Ranger of Karate”, whatever that means) who is searching for a missing student, Tony (Jacklin). Along the way, he discovers an evil, underground punchfighting ring where, naturally, meatheads fight to the death for the amusement of the paying customers. This is all organized by the evil *sigh* Verdugo (Rivero)...yes...VERDUGO. Because being a professional jerkass is such a trying task, George consults The Master (Lynch, with noteworthy hair), his old trainer. George actually spends so much time doing ab crunches, his fiance Sara Douglas (Blum), an LAPD cop, feels neglected and their potential marriage is on the rocks. That’s an actual plot point. So then George teams up with martial arts student Gary (Hill) and they try to take down Verdugo’s evil operation. But there’s a sinister secret behind this punchfighting ring...will George be able to get to the bottom of it? And will anyone understand what he’s saying? Everything Jorgo says, does and wears is laugh-out-loud funny. His accent is so thick he makes Sho Kosugi sound like Alistair Cooke. All the dialogue in the movie is amazingly stilted. You’d think a reunion of the cast of Death Match (1994) (except for Matthias Hues, who probably ran screaming in the other direction) would be on board for a film of at least comparable quality. It’s not a shining moment in any of their careers. Beyond low budget and low quality, this is NO budget and NO quality. It has that “home movie” feel and it makes Streets of Rage (1994) look like a masterpiece. We don’t want to beat up on the movie too much, because it provides about 90 minutes of laughs, but let’s be honest. It’s pure incompetent junk. Most of the movie you will be wondering why...why...WHHHYYYYY???!!!??? Where do these people come from? How did this get made?...most human beings never sink this low in their entire movie-watching lives, so if you do see it, you should consider yourself lucky (? )...you are now part of an elite club. Featuring the highly appropriate main song “Let’s Make Love” by Helena Kevorkian, Warrior of Justice is a deformed mutant baby of cinema. If you enjoy that sort of thing, and you are a masochist, do seek it out. But be forewarned. You may never be the same again. The so-good-it's-bad tag makes me intrigued, plus the Richard Lynch factor-- though if I watched everything Richard Lynch did just for him, I'd be in a lot of pain! Yeah, I am not even that big of an action fan, so I highly doubt I would enjoy this sort of thing, great review though! DTVC: It is hilariously bad. Lynch puts in a silly performance too. If you like so bad it's good movies, this is a perfect example! Matt S.: Thanks Matt! It is pretty junky most of the time.